As the final arrangements are made for this weekend’s Transition Network Conference (the weather forecast is looking good, by the way! ), a newly released report from Lloyds Insurance and Chatham House does an amazing job of putting the case for Transition to a business audience (you can download it here). Although given the mad, pre-conference swirl, I haven’t yet read it in detail, its conclusions are striking, indeed quite extraordinary, and I have reproduced them below. Nothing about the role of communities, but then this is a report aimed at business. 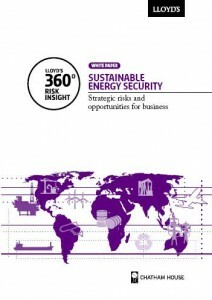 It does, however, state that any business seeking to be successful in the future will need to be prepared for ‘dramatic changes in the energy sector’, and that energy dependency will become a key vulnerability. It is interesting also that it arrives just after the new UK government announces it is commissioning a review of global resource scarcity and how it will affect the UK. This is, in effect, the Hirsch Report for British business… and provides the perfect case for the work that Transition Training and Consulting are now doing with businesses. Conclusions. 1. Energy security is now inseparable from the transition to a low-carbon economy and businesses plans should prepare for this new reality. Security of supply and emissions reduction objectives should be addressed equally, as prioritising one over the other will increase the risk of stranded investments or requirements for expensive retro-fitting. 2. Traditional fossil fuel resources face serious supply constraints and an oil supply crunch is likely in the short-to-medium term with profound consequences for the way in which business functions today. Businesses would benefit from taking note of the impacts of the oil price spikes and shocks in 2008 and implementing the appropriate mitigation actions. A scenario planning approach may also help assess potential future outcomes and help inform strategic business decisions. 3. A ‘third industrial revolution’ in the energy sector presents huge opportunities but also brings new risks. Of particular importance for new technologies is the risk of constraints on raw materials such as rare earth metals, as scarcity may drive up costs. The rapid and widespread diffusion of some new technologies may also incur negative environmental implications. 4. Energy infrastructure will be increasingly vulnerable to unanticipated severe weather events caused by changing climate patterns leading to a greater frequency of brownouts and supply disruptions for business. This throws out a critical challenge to energy providers, investors and planners in terms of choosing the location of new infrastructure and fortifying existing plants and networks. Those businesses for which uninterrupted access to energy is of fundamental importance should actively consider investing in alternative energy supply systems. 5. Increasing energy costs as a result of reduced availability, higher global demand and carbon pricing are best tackled in the short term by changes in practices or via the use of technology to reduce energy consumption. The wider use of renewable energy and even self generation, bring added price and supply security benefits. 6. The sooner that businesses reassess global supply chains and just-in-time models, and increase the resilience of their logistics against energy supply disruptions, the better. The current system is increasingly vulnerable to disruption, given the trends outlined in this report. 7. While the vast majority of investment in the energy transition will come from the private sector, governments have an important role in delivering policies and measures that create the necessary investment conditions and incentives. If the global carbon market is to become a reality then government action must be taken to bring additional price stability and transparency. Investing in a secure, low-carbon energy future may have higher upfront costs, but will deliver lower cost energy in the future. Sound renewable energy and demand side measures are crucial elements in delivering the necessary energy services for businesses and the expected return on investments. It even mentions frailties in the food system, citing overdependence on fossil fuels and gives the example of the 2000 fuel blockades in the UK, where the food system was on the point of collapse in about 3 days. A must read for those in the boardroom, and those trying to reach them. Also really good for shoving under the noses of the peak oil deniers. One of the helpful things about these kinds of report is the way they re-frame the gloomy prognoses of retired (and not-so-retired) oil executives and make it upbeat. As Rabindranath Tagore wrote: ‘sing our destruction, that we gain new life’. The message is thoroughly palatable to the mainstream of global capital: endless opportunities are unleashed by the disruption of business as usual. Schumpeter, the populariser of ‘creative destruction’, would be proud. It’s not so hard to do, since the trick is in the editing: ‘A rapid movement towards a highly efficient non-fossil energy future would seem to be the only way to stop our children’s children from freezing to death in the dark logical investment choice.’ (p.7). Those interested in effecting a transition need to gain competence in telling and re-telling all four myths, not just one or two. Lloyd’s may have got the message on oil depletion but they haven’t got the message on limits, per se. If businesses adopt the “appropriate mitigation strategies” it seems as though they will be just fine and continue the party for ever. I don’t think anyone, in positions of influence, or the populace, in general, will ever learn until collapse is upon us. What they really fail to mention is the overall impacts on the poor. Think about all the energy market purchasing power that will seek out quick fixes to energy market problems via land use: CDM, Biofuels, REDD+ the list goes on. This combined with rising inputs in agriculture (mentioned above) alongside increasingly unpredictable weather for marginal rain-fed farmers spells the destabilisation of the natural welfare system derived from land. It means a revolution, at the very least in international development and aid policies, if not in the nature of governance in developing countries. Mitigation takes 20-30 years and costs trillions to implement. We have the luxury of neither. When industrial Hemp was suppressed in the 1930’s this kind of problem was always going to occur, as there isn’t a diversity of energy sources. You can theoretically generate 600 million barrels of Hemp methanol with 1/3 of the uk land acreage. This would replace most of oil crude oil usage. Additionally, when this food is harvested, the seed can be filtered away before conversion to create a food stock, further reducing import requirements,and providing local food manufacture opportunities. It seems like they are acknowledging the issue to avoid accusations of negligence, but the fact is, economic growth, as it is defined today, cannot continue without a cheap liquid fuel to enable sustained economic activity. The hemp plant is too productive to ignore. Yes, except that a 250% increase in oil price (indeed, even a 100% increase) would devastate economies. I think it’s quite possible that we will never see sustained oil prices above what we saw in 2008 (adjusted for inflation), which is roughly twice (100% increase on) what we have now.